Cumulus Inc, 45 Flinders lane. After reading the age good food guide, I decided to head down to Cumulus.inc today. Apparently they have a great breakfast. They have a limited breakfast menu, though I guess if it’s qulaity, it doesn’t really matter. It’s all good, so anything you order will be guaranteed to taste good. Cumulus Inc is a smallish place (when I say small, it seats about 50 people, plus a bar area) . It is located in the paris end of Melbourne, and with good company in terms of restaurants surrounding it. I have been to Terra Rossa for breakfast as well, and have enjoyed the breakfast there as well. So in a way, I was looking forward to this. 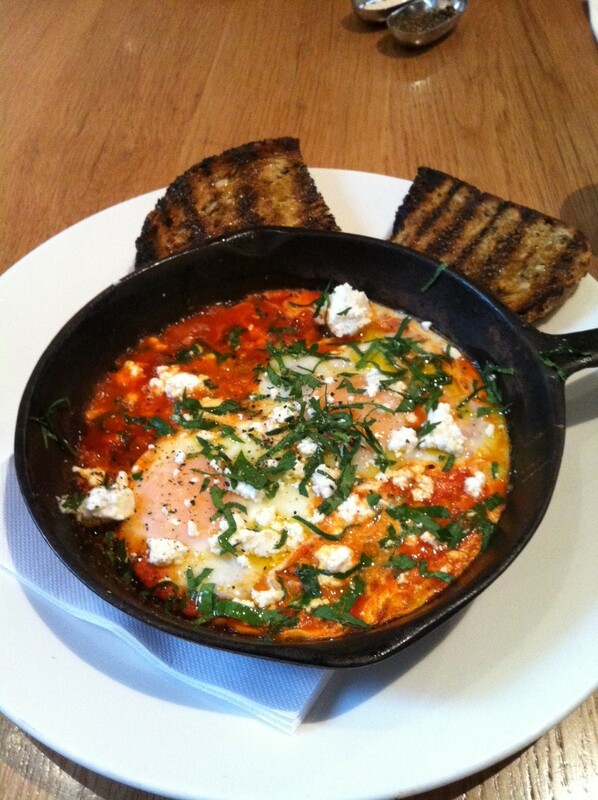 I decided on the Shaksouka, baked eggs with roasted peppers and marinated persian feta. I have had a similar dish at New York Tomato, and also at a couple of other places. I have enjoyed it, so why not ? Along with this, I ordered a latte, which they have single origin, organic fair trade. I could not get a glimpse of the brand, either at the coffee machine or on the menu. Compared to some of the finer coffee’s around melbourne, this wasn’t great. Though it did have a good standard. It had a mild aroma and a mild taste. It wasn’t too complex, therefore this made it smooth, easy to drink. It had a good color too. Overall not bad. Shakshouka : Wow !! that’s all I can say. This was fresh. The aroma of the dish at it was served was supremo. It was cooked to a great consistency, and all the favours worked really well, with no ingredient overpowering another. The feta added a good texture to the dish, and the whole dish seemed to be a well thought. I am unsure whether this was an original from Cumulus, or whether it was copied from an “ancient” recipe, though, it was enjoyable, whichever the case. The staff were all friendly, and provided good service through the experience. In total, I paid $19.80 for the dish and the coffee, so in terms of breakfast, was quite pricy. Though, this is not a simple “roadhouse” breakfast, it had definition. It was far better then the stock standard breakfast at most of the cafe’s around. In honesty though, the dish could have been shared by 2 people, and along with toast, will be a good breakfast experience for 2. Dining on my own though, I was able to have the whole dish to myself, and beleive me, I enjoyed every bite of it. Well, this is hard to judge, considering I have not really measured any breakfasts before, though I have had plenty of them Though, considering that this was potentially the best I have had so far, I am going to give this a 7. (was the highest coffee score acheived). The service was fault free, food great, and the coffee better then average, but by no means the best. Categories: Breakfast and Coffee, Coffee Challenge Tags: age good food guide, aroma, best breakfast, breakfast, coffee, cumulus inc, melbourne, Melbourne breakfast, new york tomato, persian feta, shaksouka, single origin. « Market lane cafe, Prahran.